We are getting more productive and less people are required. That would be good if the unemployed were not excluded from the consumption of production. If you don't work, you are denied access to the abundance the technology can provide. To make things worse, the middle class, those who still have a job, are progressively disappearing and getting broke too, as the competition for fewer jobs is drawing wages down. The decrease in purchasing power of the people is not good for business either. Many businesses that can't sell enough have to close. That increases unemployment. We are spiraling down and asked to endure more and more austerity. A small percentage of people seem to do very well though. Those who own the technology and the means of production, the capital-owners, are making a lot of money and reap most of the benefits of the increased productivity. 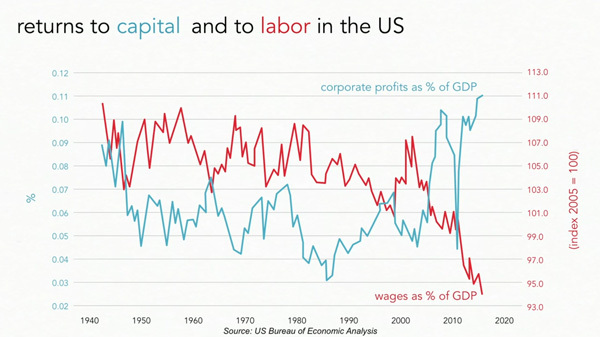 As the graph below shows, the corporate profits soar while wages go down. Technology is creating more poor and widening the gap between rich and poor. A minority of super rich end up owning the larger share of the wealth. The nationalisation of the means of production which Paradism intends to implement will bring social justice and bring an end to the class struggle and to a system that makes the rich the beneficiary of the gains of productivity. It will give birth to an egalitarian society where everybody can have the same access to consumption and nobody will lack anything. The lasting social peace can only come with the nationalisation of technology and the means of production. It is the key step Paradism will make towards the creation of a society of abundance without work and money.